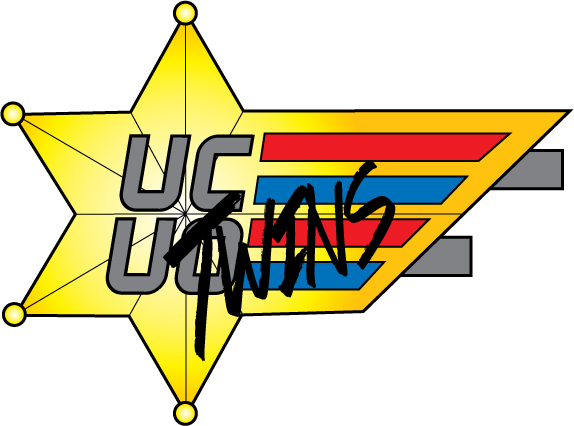 The next cartoon I'm sharing is the Ultra City Ultra Twins, an amalgam of COPS and Centurions. In the fictional Ultra City, Simon and Shaya are the twin children of the police captain, Steve Stryker. When they sneak after their father while arresting a robber, they see him fatally wounded by the criminal. In his last moments, Steve give his children two halves of a Ultra City Ultra Officer badge, which when combined gives them powers based on four main police roles. Shaya, the more athletic and aggressive of the two, prefers to use Pursuit mode, which gives her rocket boots for tailing crooks and a launchable handcuff tether, and SWAT mode, arming her with two arm-mounted piledrivers. Simon, her academic brother, sticks with Detective mode, granting him enhanced senses and communications, and Riot mode, which gives him a shield and a gas cannon. Together with their robotic pets, K-9000 and APBee, they assume the roles of the Ultra City Ultra Twins, helping the police force while remaining a secret from the new chief, Captain Cross, who wants to take the badges back for himself. Simon and Shaya Stryker looked up to their father, Steve Stryker, captain of the Ultra City Police Department. The kids follow their father as he trails a crook, Shaya impressed with her dad's ability to chase the crook down, Simon impressed with how he followed clues to find him. Unfortunately, the robber pulls a gun and shoots Steve, fatally wounding him. The kids go to his side and he gives them the Ultra City Ultra Officer badge that he was using to follow the crook. However, he breaks it in half so they can only use them when they work together. 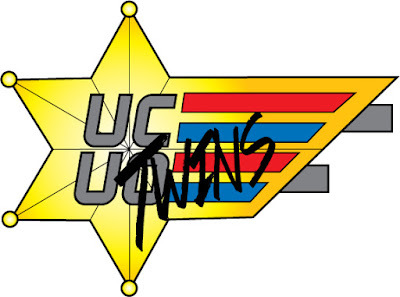 Now, Shaya and Simon Stryker rid the city of crime as the Ultra City Ultra Twins. Ultra City Ultra Twins wants to show the dangers of guns. While the UCUT use weapons that involve police tools (shields, gas canisters, and night sticks) besides firearms, the enemies are all predominantly gun users. Each of them are based completely around a different kind of firearm, however outlandish they may be. Each of them also has a transformed version based on their weapon that implies the weapon has taken over. Care must be given to show their dependence on their weapons - without them, they give up immediately. Shaya Stryker - The elder of the twins, she's a very competitive person, competing in all high school sports. She's aggressive and ready to fight at a moment's notice. She's not interested in detective work, only going one-on-one with the criminals. She never learned the lesson her father tried to teach her: slow down and pay attention. Simon Stryker - The smaller of the two but much smarter. He prefers the sciences over athletics. He's a brain and would spend the whole day in a lab if possible. He always looks at all the possibilities and makes plans for every outcome. He's a detective above all else and never learned the lesson his father tried to teach: planning without action never accomplishes anything. Sgt Bosco - Steve's old partner on the force. He's riding a desk now, but keeps up on all the cases. Only one on the force that knows Shaya and Simon are the Ultra Twins. He's not totally supportive of them fighting crime, but know better than to try to stop them. He's old, a few years from retiring and likes to remind them of it. He keeps the twins informed of new cases and tells them what they're up against. He's Shaya's hero after seeing how he takes down criminals. Captain Cross - Took over after Steve was killed. He hates the Ultra Twins and wants the badges back in police hands. He doesn't know who they are, and only barely tolerates the twins when they visit the station because of his respect of Steve. Dr Drive - The creator of the Ultra Officer badges. He doesn't know who the Twins are, assuming they're part of the police force. He helps them figure out extra powers for the badges and built K-9000 and APBee, assigning them to help the Ultra Twins. He's old, forgetful, and aloof. He's very much young at heart and is Simon's non-cop hero. K-9000 - A robotic dog that has become Shaya's sometimes partmer. He's very protective and usually growling at something. His legs fold up into wheels, turning into a skateboard of sorts. He talks in a German-esque accent. APBee - Simon's partner, a robotic bee that can serve as a helipack for Simon. He's even more scared than Simon usually is. Acts as a mobile communication center/computer with the police force's computer system. Speaks in beeps that only Simon is able to understand. I really enjoyed making this show, especially because the two characters play pretty heavily in the second Old School Evil book. But to be honest, the villains were way more fun to come up with and I've got five of them showing up next week when we see the rest of the production bible.